This List of navigation authorities in the United Kingdom is a list of links to any navigation authority in the United Kingdom, relating to any navigable waterway, aqueduct, canal, navigation, river or port. the navigable drains of The Fens. Environment Agency – environmental regulatory body, manages its waterways as part of its water management obligations. Broads Authority – manages its waterspace as part of the National Park Family. This is because no other national park has a navigation running through it and the "Sandford Principle" of conservation only would not be feasible. Manchester Ship Canal Company  - the majority of shares are owned by Peel Ports, a subsidiary of The Peel Group. ^ "Associated British Ports - Humber, the Competent Harbour Authority for the River Humber". ^ "Avon Navigation Trust website". ^ "Basingstoke Canal Authority website". 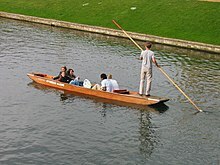 ^ "Conservators of the River Cam website". ^ "Dart Harbour and Navigation Authority website". ^ "Driffield Navigation Trust website". ^ "Manchester Ship Canal website". ^ "Manchester Ship Canal - Peel Ports". merseydocks.co.uk. ^ "Medway Ports website (Tidal section)". ^ "Middle Level commissioners website". ^ "Associated British Ports - Hull". ^ "Port of London Authority website". ^ "Severn Estuary navigation and pilotage website". ^ "Port of Bridgwater". Sedgemoor District Council. Retrieved 4 January 2011. ^ "Sleaford Navigation Trust website". ^ "River Wey navigation". National Trust. ^ "Witham Fourth District Internal Drainage Board". This page was last edited on 6 February 2017, at 01:14 (UTC).